Visiting the top of London high rise buildings is definitely one of my favourite London things to do. 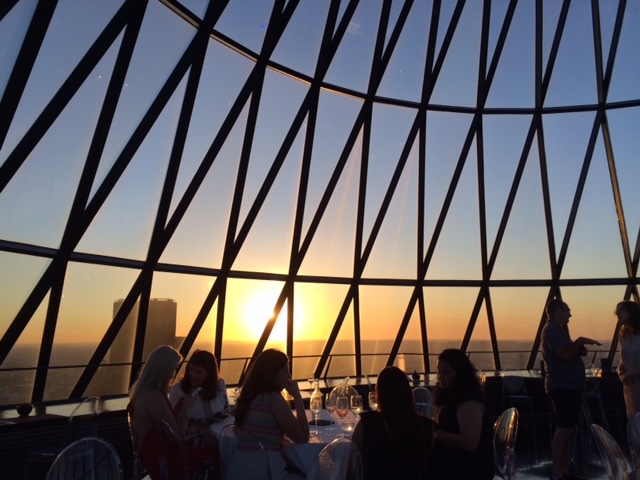 So I was very excited to attend a Champagne tasting event that was recently hosted by Sheerluxe at Searcy’s in The Gherkin on a Monday evening. 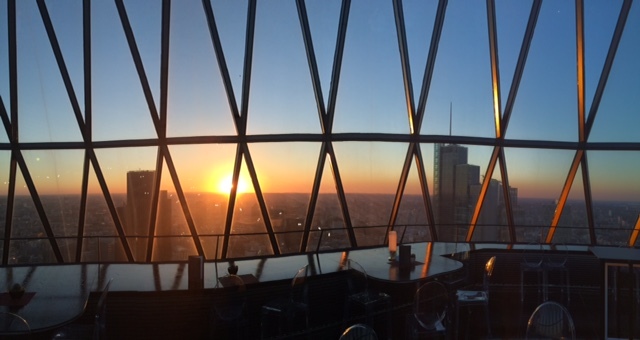 My hubby and I are not the biggest Champagne drinkers but I definitely couldn’t let an opportunity to visit the Gherkin pass me by. 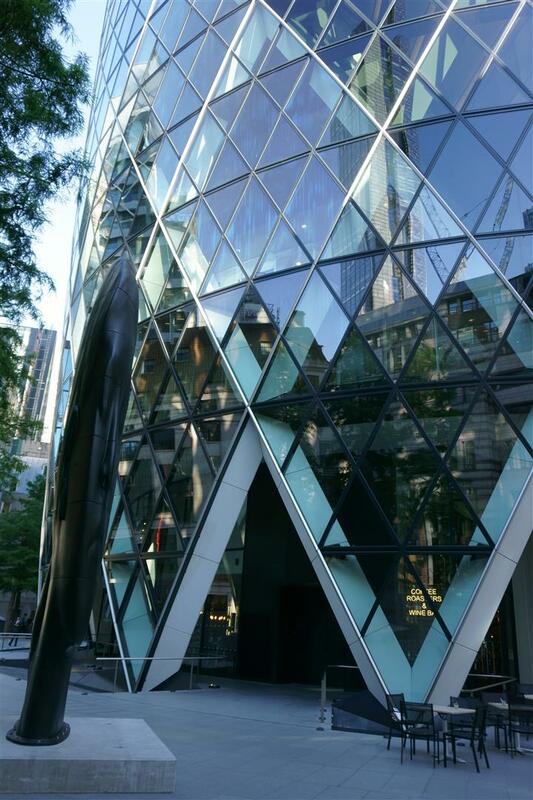 This bullet shaped building also happens to be one of my favourite looking buildings in London. Fortunately London was experiencing the hottest period of summer 2016 so we had a beautiful day of blue skies. 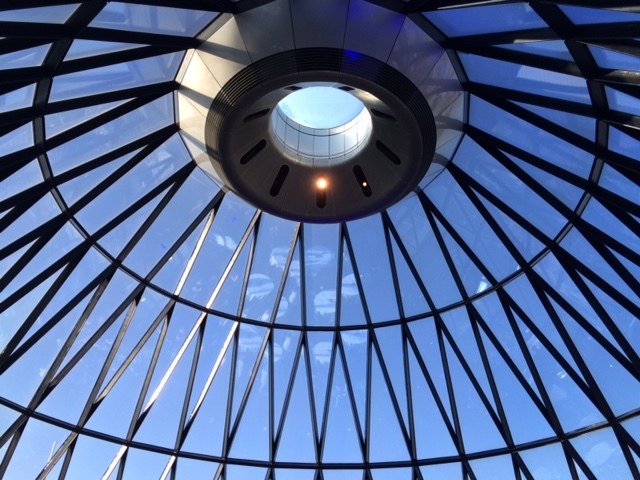 Upon entering the Gherkin we went through airport like security and was told to take the elevator up to the 39th floor. We exited the elevator and were then welcomed by one of the Sheerluxe ladies who pointed us to the stairs to the 40th floor. 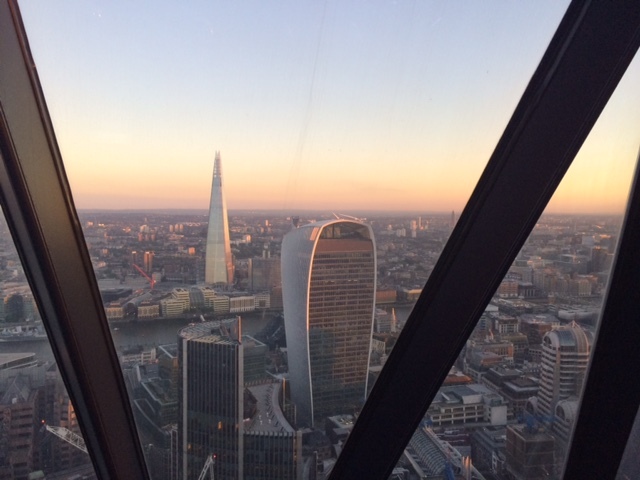 As we climbed the stairs we were greeted by the magnificent glass domed roof overlooking the splendid city of London on this gorgeous evening. I think everyone was just in awe of their surroundings. 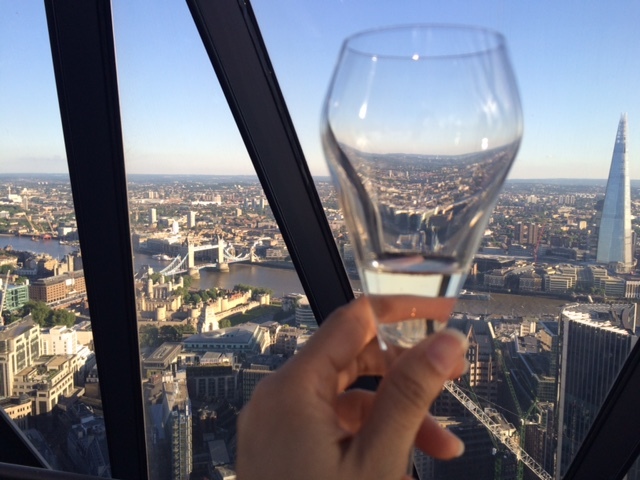 A waiter served us glasses of Champagne to sip on while soaking in the views and taking photos galore. After everyone arrived, we sat at one of the many tables and got ready for a relaxed evening of Champagne and canape pairings led by Jonathan Simms, the Ambassador of Champagne for Pernod Ricard. Jonathan was keen to keep the evening light and enjoyable and didn’t want to bore us with too many technical details about Champagne. We started the tasting with Mumm Cordon Rouge. (Mumm is pronounced as Moom.) 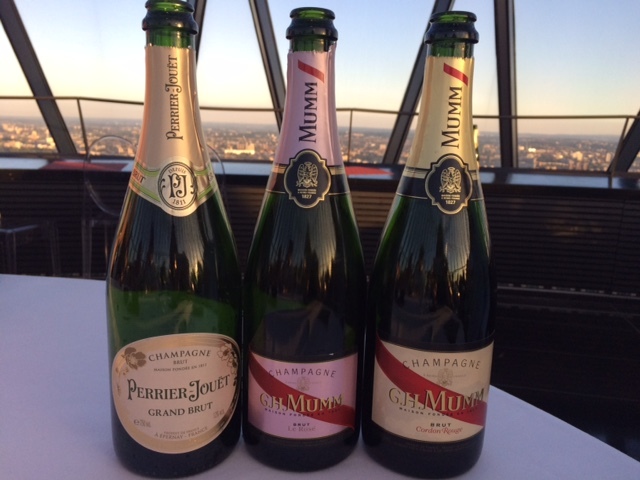 Jonathan then proceeded to tell us a bit about the history of GH Mumm starting in 1827 with the founders who were 3 brothers based in Cologne. When these German winemakers realized the growing popularity of sparkling wines produced in the Champagne region, they decided to expand the family business to Reims. From then on, the company progressed to become one of the leading international Champagne brands in both France and worldwide as it is today. The Mumm Cordon Rouge Champagne is a bright sparkling, light golden yellow colour. Unfortunately I didn’t really enjoy this Champagne as I found it less sweet and very strong in flavour. 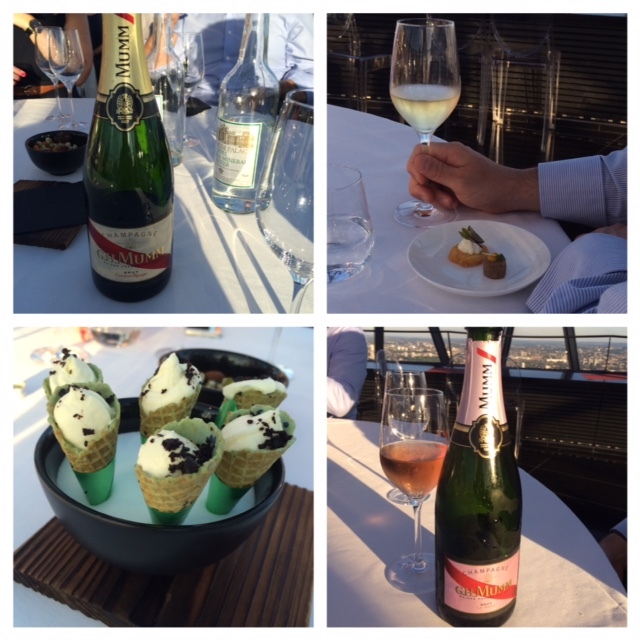 We then moved onto Mumm Rose, a pale salmon pink coloured Champagne which was definitely more palatable to me. In between tastings canapes were also served. Lastly we finished off with Perrier Jouet Grand Brut Champagne. This Champagne is a lovely slightly peach colour, elegant, light, floral and easy to drink. The main difference between vintage and non-vintage Champagne, is not that the vintage is old but that it is made from the grapes of only one year’s harvest, whereas non-vintage Champagne is a blend of different years’ harvest. The history behind Perrier Jouet is a love story from a husband and wife team who founded their Champagne house a year after 24-year-old Pierre Nicholas Perrier married his 19-year-old wife Adele Jouët in Epernay, France, taking his surname and her maiden name to create the brand. Perrier Jouet is the only Champagne served at the House of Chanel. After about an hour or so of talking and stopping to chat to everyone at their tables, Jonathan wrapped up the evening and left us to socialize with the others from our tables. Most people left soon after but there were a few of us still keen to stay and watch the sun set. 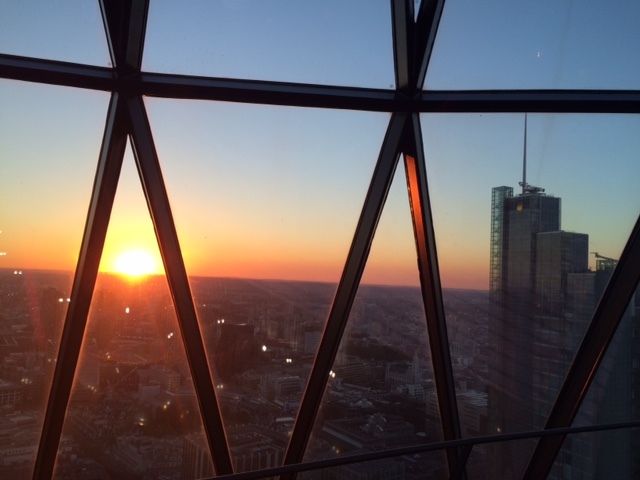 Have you been to the top of the Gherkin? What are your favourite high rise buildings in London? I’d love to hear in the comments. And stunning pictures, I never realized how tall this building is.